Companies that produce makeup and other personal care products rank in billions of dollars each year from consumers. They bust out new products all the time, and the United States government doesn’t require any mandatory testing for these products before they hit shelves. Even if you’re careful to avoid toxins in your food, drinks and household cleaning products, they may be lurking somewhere you didn’t expect – in your makeup. You might regularly check food labels, but have you ever thought to check your makeup labels? What about your other personal care products? Lipstick, deodorant, shampoo and other personal care products are usually not required to undergo testing. Many don’t even contain a full list of ingredients. If you apply lipstick a few times a day, each day, you could be ingesting high amounts of lead over the course of your lifetime. Chemicals aren’t just ingested. 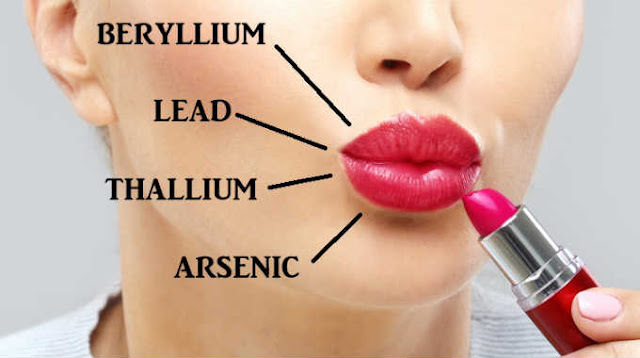 They can also be absorbed through your skin, which makes your makeup a major culprit. 5 foundations, 4 concealers, 4 powders, 5 blushes or bronzers, 7 mascaras, 2 eye liners, 14 eye shadows, 8 lipsticks or glosses. Researchers found serious heavy metal contamination in virtually all of the products. Of the products tested, 96% contained lead, 90% contained beryllium and 61% contained thallium. They also found that 51% contained cadmium while 20% contained arsenic. The bad news: most of the products contained an average of four out of the eight metals tested. The even worse news: each product contained an average of two of the four metals of the highest concern, which were arsenic, cadmium, lead and mercury. These metals are known to be toxic, and they can trigger many serious health issues. In the Canada study, 51% of the products tested contained cadmium. Cadmiun is a known carcinogenic material. Research has found cadmium in breast cancer biopsies. It’s used be cancer cells to multiply in lab trials. A serious concern is the fact that many of these metals don’t cause serious health problems immediately. Instead, they cause the body to develop problems over time. With consistent use, they may increase your risk of cancer, reproductive disorders and many other health issues.